Our C-litter was born on July 11, 2015!!! 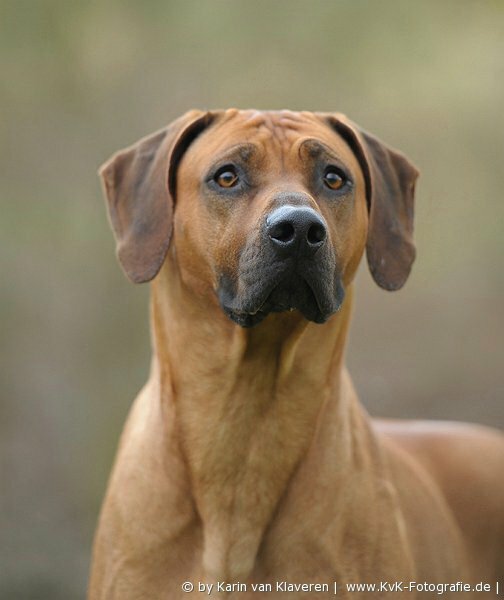 We have 3 correct ridgeback puppies - 2 girls and one boy! TOP RR in Norway 2008-2011! International & Nordic Champion, Champion of Norway, Sweden, Denmark, Latvia, Estonia. Nordic Winner 2008, Finnish Winner 2008, Norwegian Winner 2010 & 2011, BISS 2008, 2013, 2014. Breeder & owner Marit Hjartøy, Kennel Kangelani, NORWAY. Thanzi is so outstanding in many qualities - temperament, look, offspring - he has everything a breeder would look for. Thanzi and Marit was visiting us when Bora was just a small puppy and Thanzi's lovely temperament was the reason why I knew, that some day I will use him also for my other litter. And here the time came :) I am extremly happy for the opportunity to use Thanzi in my breeding, there are just a few GOLDEN boys out there and Thanzi is definately the ONE! 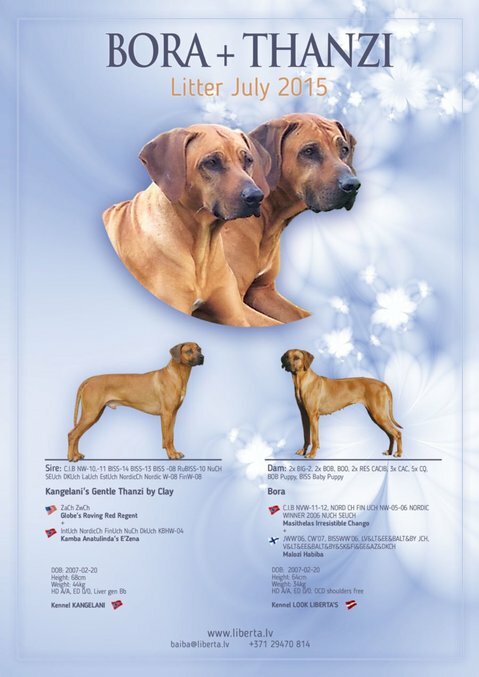 2x Best in Group 2, 2x Best of Breed, Best of Opposite, 2x RES CACIB, 3x CAC (Latvia & Lithuania) , 5x Champion Quality, Best of breed puppy, BISS baby puppy. Breeder: Kristine Liberta, owners Kristine Liberta & Baiba Arnicāne . Bora is from my lovely B litter, her mother is my all times favorite RR girl BISS JWW 06, MULTI CH Malozi Habiba and Bora's dad is Marit's INT CH Irresistible Masithelas Chango - so actually this litter is 75% Norwegian and 25% Finnish RR's. Bora has been a lovely girl and has enjoyed the life with all her heart, she loves to play, to run, to sleep and Bora has an outstanding and very calm and reliable temperamanet, which is so important for me. Bora has been showed very limited times in her life, but she has enjoyed it a lot and always brought home some lovely results, so I would say Bora is the most successful RR girl I have had, as from so limited showing so lovely reaults - she truly is wonderful. I hope we have many winns still ahead, but now it's time for a lovey bunch of puppies, so keep fingers crossed! Bora was visiting Marit and Thanzi in May and we have a lovely puppy litter born on July 11, 2015! Serious inquerries welcome - kristine@liberta.lv or +371 29299668. We are breeding not for quantity but for quality and if you are interested in a puppy from us you are very welcome to contact us and ask all the questions in advance. 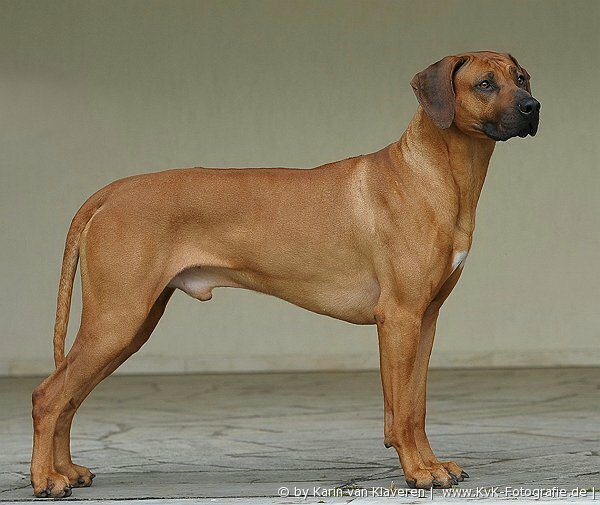 Even if we don't have puppies at our Kennel, we have many Ridgeback friends all arround the World to suggest the best possible Rhodesian Ridgeback puppy for your Family from a responsible breeder. Please feel free to leave a message here or write me an e-mail - kristine@liberta. lv.